I’ve been away for some time due to some fun stuff happening over here. I can proudly announce you I passed my photography exam and can go through to the next module. Besides working on my photographs there was some football too as you might have read in this BBQ recipe round-up with some of my favorite bloggers. But I bet most of you don’t come to hear what I’ve been doing lately, so let’s move on to the recipe. It’s not because I didn’t had the time to write that I didn’t fire my BBQ. This recipe appeared on instagram some time ago. There’s more to come so I’ll try to serve you some new food weekly by now. 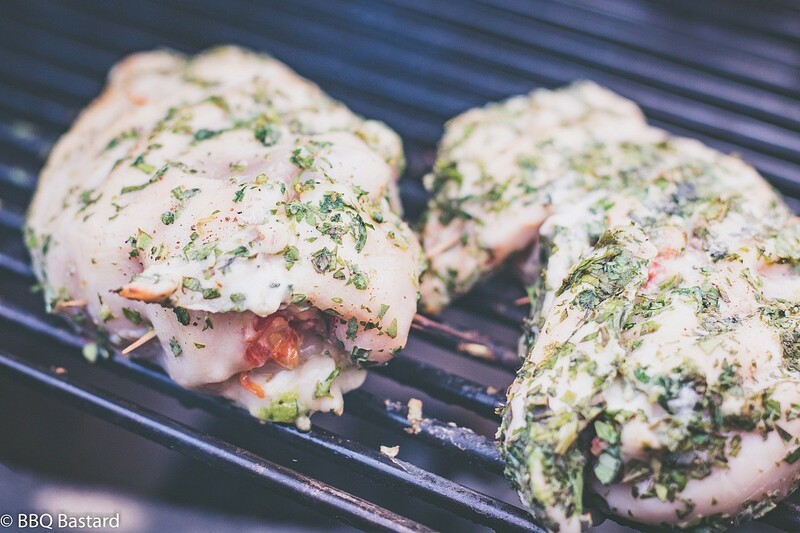 This chicken recipe is based on the italian classic Tomato Mozzarella and Basil! A superb combo that combines well with chicken. So why not stuff the chicken with this italian classic and smoke it? Instead of fresh tomatoes I chose for sundried tomatoes and used buffalo mozzarella! You could use regulare mozzarella too but in my opinion the buffalo mozzarella is richer in taste. For the smoking part I used the Port Barrel Oakwood I received from Smokewood Germany earlier this year. As I mentioned in this “Irish coffee pork tenderloin recipe” I’m happy with this brand of oak wood! It’s more subtle than the Jack Daniels Barrel wood that’s known better but has more variety! Moreover my wife is in favor for subtle smokey flavours! 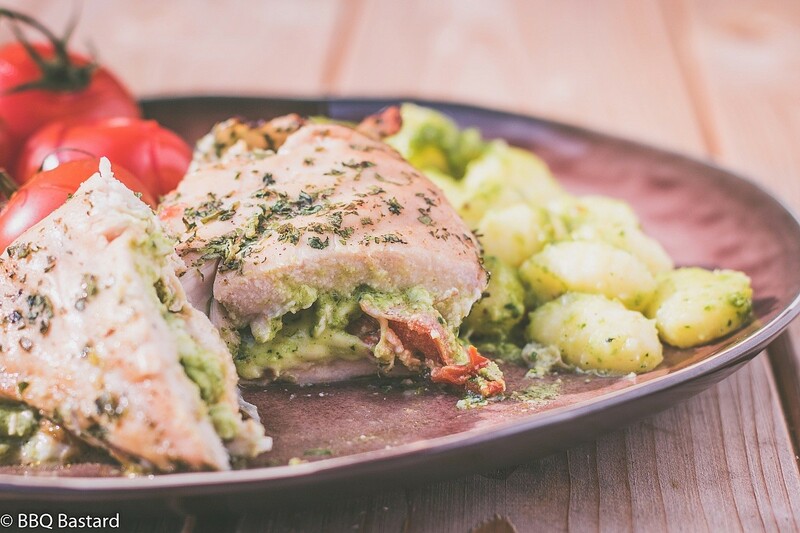 How did we like the tomato mozzarella stuffed chicken? That’s easy! I bet you can imagine yourself how it tastes? The combo is well-known and approved by many! Yet I believe it’s different. Since the mozzarella melts during the smoking process it’s less fresh but who doesn’t like molten cheese? You should try making homemade pesto too by the way! A lot better than those you can buy in stores! Thank you for reading! I hope you liked this new post? By the way, what do you think of the new photography style? Hope to hear your opinion in comment below! Feel free to share this recipe with your friends, I bet they won’t be mad if you do. 2. While your BBQ is getting fired up you can start slicing the chicken breast in envelopes (see picture above). This way you can easily stuff the chicken breast and roll it back up afterwards. 3. Cure the chicken envelopes with salt and pepper on both sides. 4. 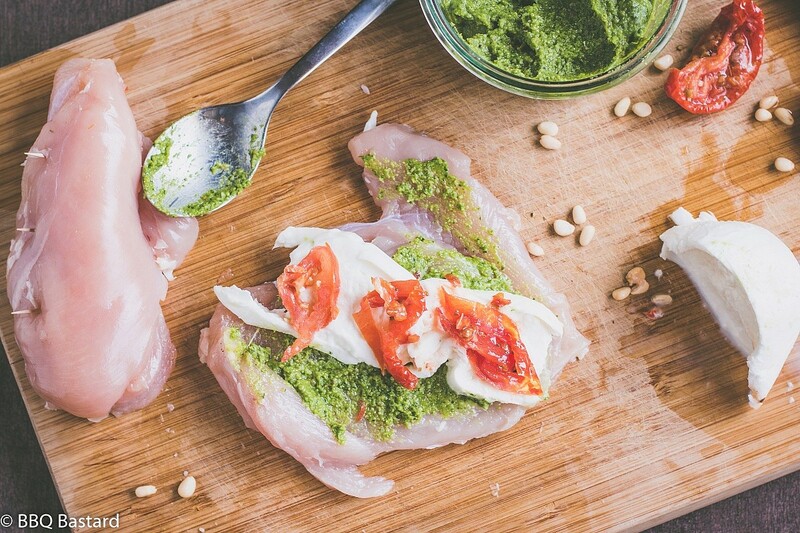 Spread some Fresh Pesto on one side of the chicken, add sliced buffalo mozzarella and sundried tomatoes. 5. 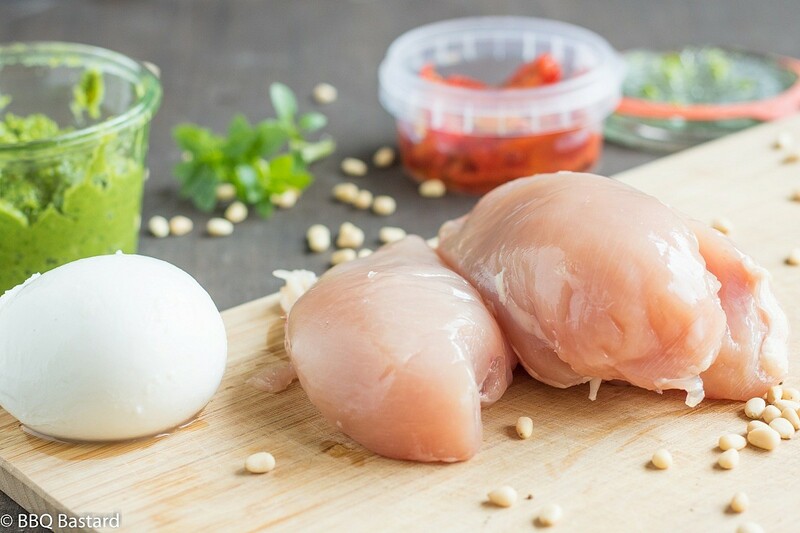 Roll the chicken breasts and secure them with some wet toothpicks. 7. Add some smokewood to the fire. I used Port wood and wait until the smoke turns blue. Meanwhile you can grease your Grid. 8. 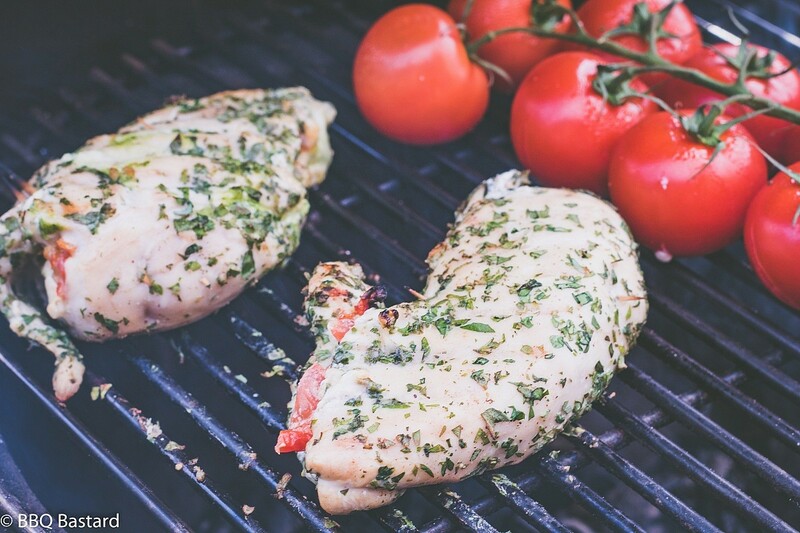 Smoke the stuffed chicken breasts until you get an internal temperature of 75°C/165°F. Make sure you are meating in the center of the chicken and not in the Cheese!